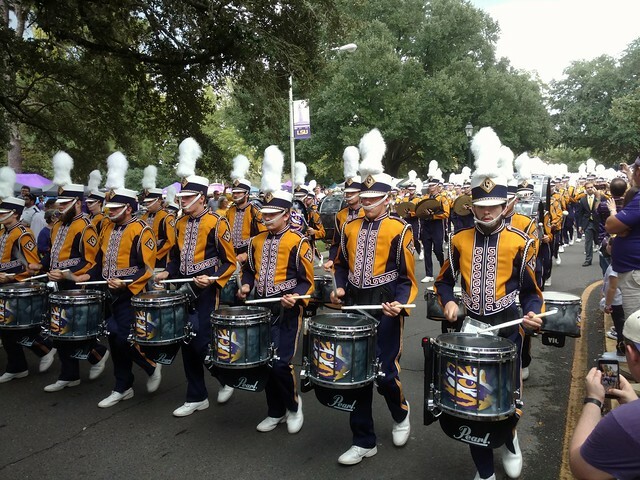 We spent last Saturday in Baton Rouge participating (I guess) in the homecoming festivities on the LSU campus. 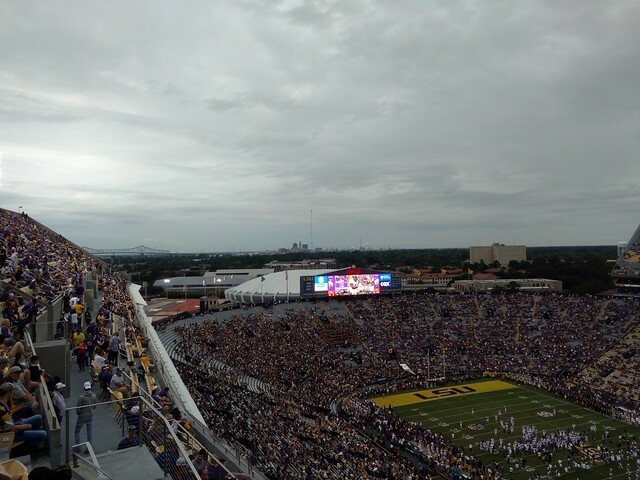 By that I mean we did some tailgating and watched a football game from high up in the Tiger Stadium terrace while the first somewhat legitimate cold front of the year was blowing through. Which is to say we got rained on. That's supposed to happen never. Anyway here is the classic view of your state capital skyline. There's the Capitol building in the center. That's where all the laws are passed. To the right is the oil refinery where most of those laws are conceived. In the foreground, of course, is the football stadium where everyone's attention is focused while all that goes on. It was a good day stumbling around campus. Here is the Tiger band passing in front of the Pentagon dorms on its march to the stadium. 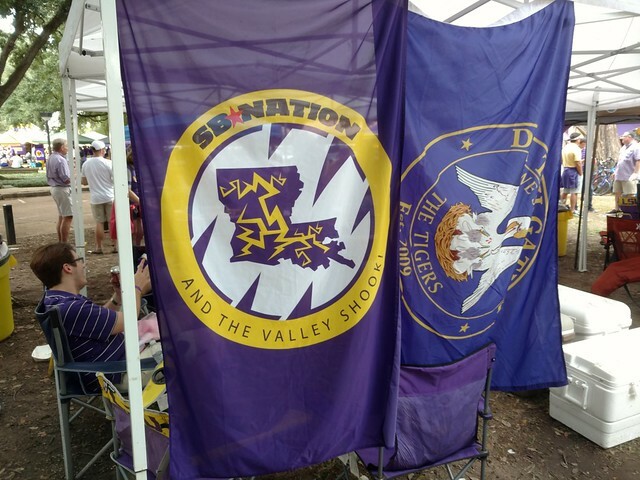 And here is the Valley Shook tailgate tent from where we bummed a bunch of pulled pork, smoked chicken, mac and cheese, grits, and.... look there was a lot of stuff and I was too busy to take any nice pictures of it. Which is fine because Zach promotes his own work well enough already. 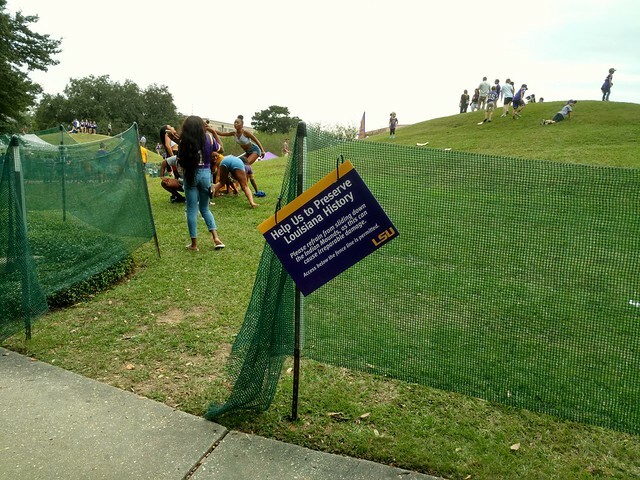 Finally, here is the sign that asks visitors to help preserve Louisiana's cultural heritage by staying off of the Indian Mounds. Naturally, the children climbing the mound in this picture had taken one of these signs down and were using it as a sled. 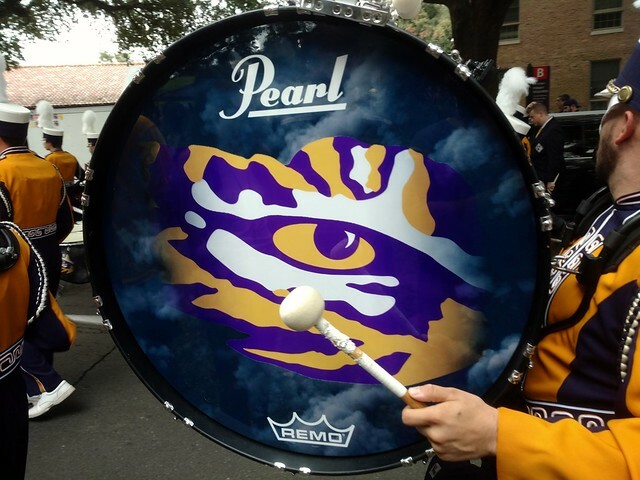 LSU's football team is pretty good this year. Not great but pretty good. This doesn't necessarily mean they've been overachieving. It's fine to put them Number 4 in the country (UPDATE: now number 3 in the playoff ranking) for now but let's not expect them to finish there. There isn't one thing they do dramatically better than anyone else in the country. There's no breakaway threat on the offense. The defense doesn't have a dominant, unblockable pass rusher. They do have a fairly outstanding middle linebacker but that guy isn't available to start this week against Alabama despite the Governor's efforts. Anyway, like we were saying, there's not any one dominant trait about this LSU team that frightens people. Instead their success this season has been in their ability to do a little bit of everything pretty well. They don't make mistakes. They don't commit turnovers. They don't miss a lot of tackles. This is going to sound nuts but I think the most apt way you could describe LSU this year is as.. extremely well coached? Not a lot of people outside of Louisiana want to hear that. But Ed Orgeron is officially on the Coach Of The Year watch list now. And if the team the writers had picked to finish 5th or 6th in their division ends up a one or two loss team come bowl season, then that's going to be really hard to argue against. Of course, we all know what that means if they finish with one loss. It means, as Scott Rabalais puts it, they would have defeated the black hole. Saturday, just about every college football fan not present is going to wish he or she could experience a night like this in Death Valley, and just about everyone not wearing Alabama crimson is going to pull for LSU. Pulling for the Tigers to upset the status quo, knock off the big dog, aggravate the stuffing out of Saban. Maybe make him throw his headset until it breaks. An LSU win, as improbable as it may seem, could save this college football season from the black hole that is Alabama. Is it reasonable to expect this pretty good.. but not great... LSU team is capable of that? Probably not. But there is also a powerful tendency toward magical thinking with regard to what sorts of things are and are never possible in Tiger Stadium. And who are we, who sat there ourselves on a rain soaked Saturday evening only last week, to deny the fun of that to anyone?